The field school is located in Sudak, Crimea, Ukraine. From Simferopol it takes approximately two hours to reach Sudak and from there it takes a further thirty to forty minutes by car or van to the accommodation area/diving camp. The team will be traveling from the accommodation to the excavation site by car and/or van. The way from the camp to the excavation site takes about 20 min by car along a winding mountain road. The plan below shows a more detailed map of the region. 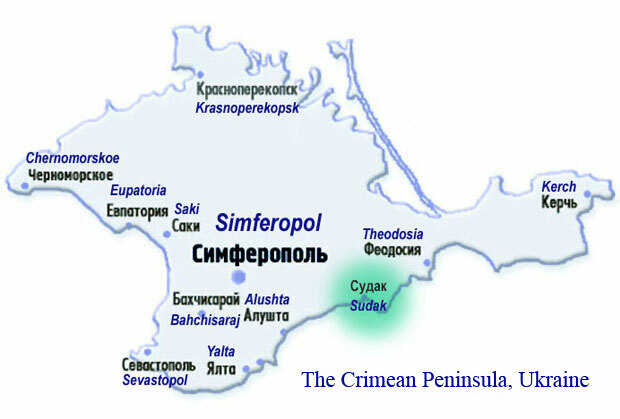 Map of the Crimean Peninsula.